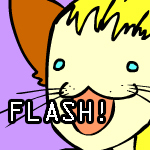 A flash about Anders and his kitteh. Dancing. Any art I may be producing these days will be posted to my Patreon, where I intend to keep most of the content free and public. Visit me here if you are interested! Thank you for faving my auto-tiles! Hey, thanks for the favs! I'm glad you like my stuff.